← I love you, Yakult! 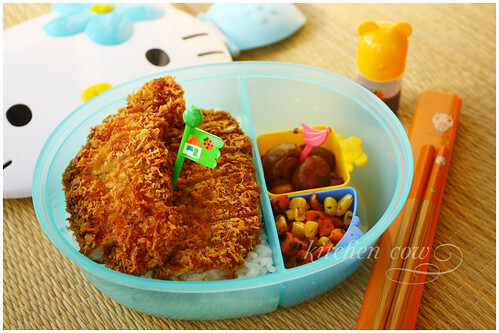 Another backlogged bento sees the light of day! This one was prepared, photographed and eaten October last year but hey, you have to admit, it still looks yummy. Presenting yet again, one of my favorite homemade freezer staples, Tonkatsu. Easy to make, easy to store and easy to cook, tonkatsu’s equally delicious, prepared fresh or fried from frozen. Just slather on the Tonkatsu sauce (I use either Bulldog or Kikkoman) and it’s happiness all around. To go with the Tonkatsu and rice, I lightly sautéed some button mushrooms and sprinkled on a little soy sauce for flavor. I also steamed some frozen vegetables, added butter and some dried parsley. I really prefer fresh parsley but my windowsill herbs have long since died. I think it’s a sign to start a new herb garden, don’t you think? With all the cooking you do, I think it would be great if you can restart your herb garden. BTW, I love the lighting in this shot. Ginutom tuloy ako.